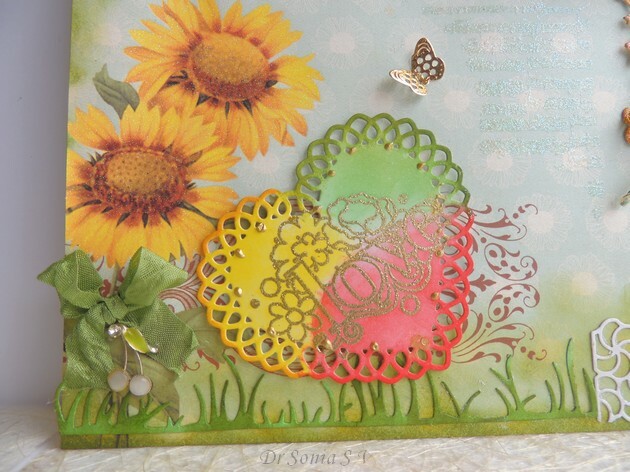 Dear friends Thank you so much for the sweet encouraging words on my daughter's Stamping Fun post -- blogger friends are the best !! My little girl sat on my lap and read each and every comment last night! She was beaming! 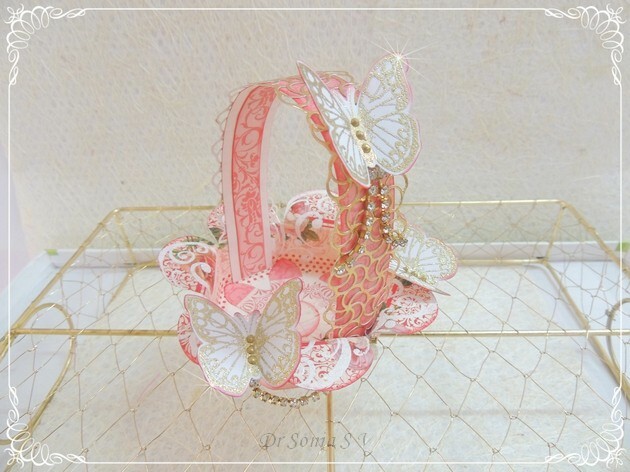 Now back to big girls' fun - sharing yet another easy paper basket made with the flower punch board. Flower Punch Board -If you dont have a flower punchboard you could even free hand cut the scallops and follow the rest of the tutorial steps. Take a 12 x 3 inch Pattern paper / chart paper and punch out a strip aligning the score lines at “S” mark on the flower punch board.Score only the straight lines, don't score the diagonal lines at each punch. 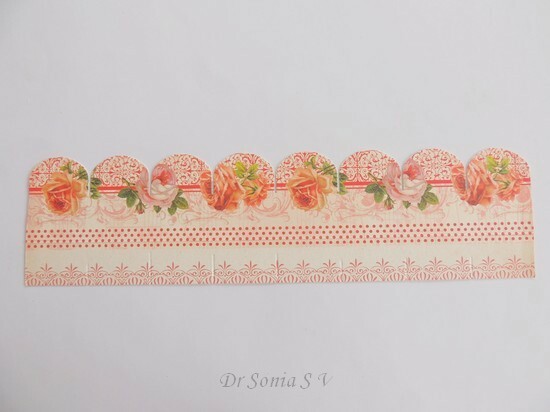 On the reverse side of your punched paper strip , score at 1 inch from the straight border using the flower punch board or a scoring board such as a Scorpal. 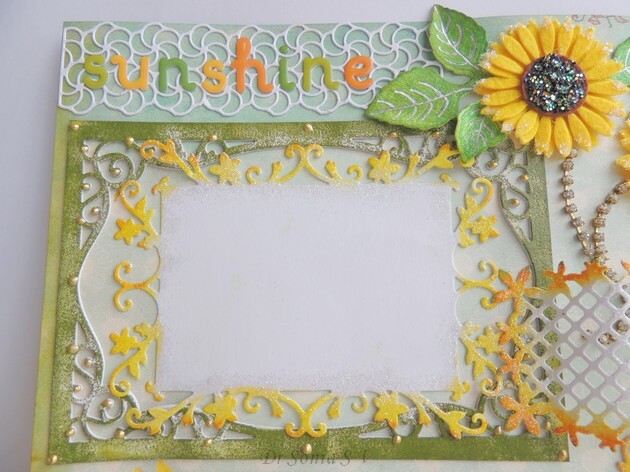 If you are using the flower punch board line the scalloped edge roughly midway between the “L” and “M” marks on your flower punch board and score. 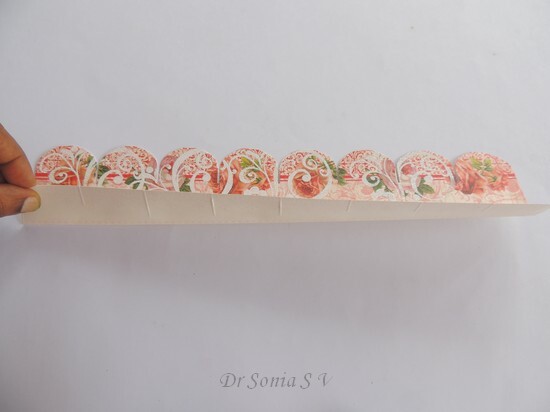 At this stage if you wish you can further jazz up your paper strip by stamping and embossing like I did using a flourish stamp and sparkling snow WOW embossing powder.You can also add further interest to your paper basket by inking the edges of your petal strip using your favourite inks . 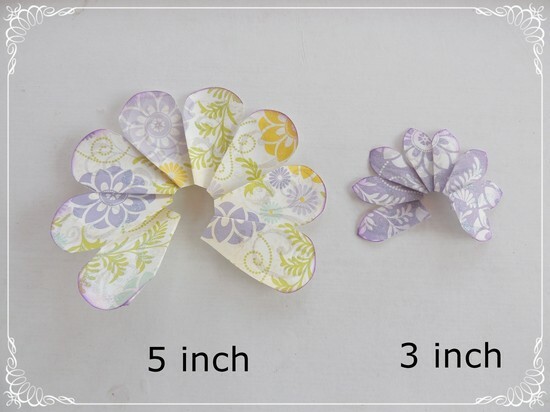 You will get a 7 petal cup shaped flower when you evert the petal edges using the shaping tool of your flower punch board [ you can also use your fingers to evert the petal edges]. 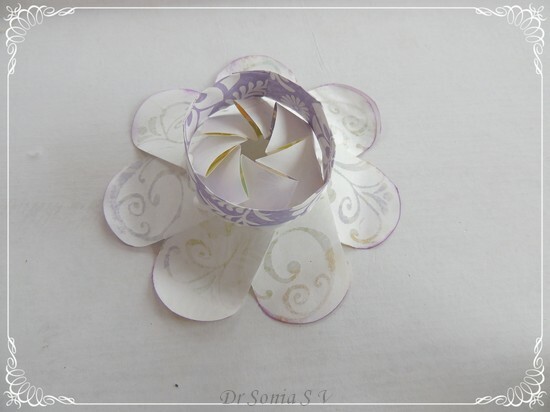 To close the gaps in the center and convert your flower into a basket ,either stick a circle on the under-surface or within the flower cup or add a punch-craft flower like I did.You can make a 3 inch diameter “ XXS” flower using the flower punch board and stick it to the center of your cup shaped flower to make a flower basket. I used a 10 and 3/4 inch x 1 inch pattern paper ,inked the edges and added a poppy stamps swirly curve die cut on it and stuck it inside my flower baskets. Here is the finished basket with sparkling gold embossed butterflies and golden chains.Love how the light reflects from all the gold! I had lots of fun trying out different ideas on the basket handles.On this cheerful orange yellow version of the paper basket I added a Martha Stewart punched pattern paper strip and a pom pom centred flower made using the flower punch board. Stuck the flower basket on a larger flat version flower again made using the flower punch board. Since I used green pattern paper to make the larger flower I think it looks like leaves dont you think! 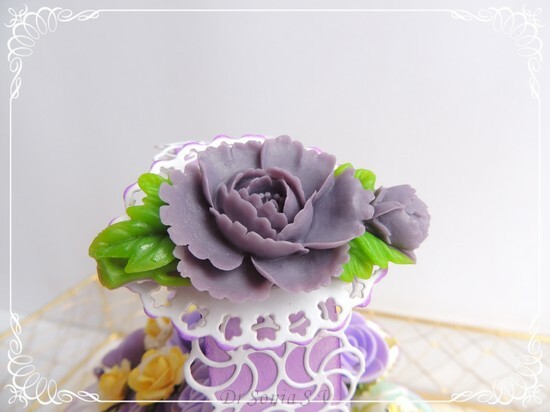 This has been a super long post but I didnt want to miss any detail so that anyone wishing to try making their own paper flower baskets would find it super easy! I hope you enjoyed this tutorial --from the comments to my previous posts I understand the flower punch board is a fairly new crafty tool and not many have it but the main purpose of this tutorial is just to give some fun ideas to create a 3 D basket plus give enough details to help those who already have / are planning to buy the flower punch board ! Do tell me how it is...hopefully didn't put you to sleep!! 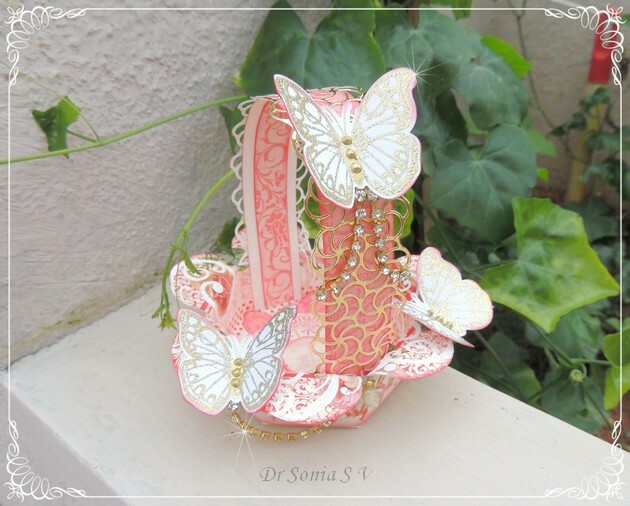 Dear friends this is just another fun post to share my little girl's stamping. 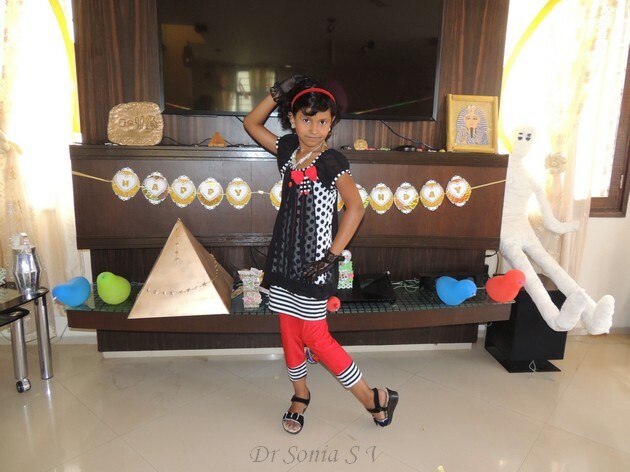 You will be wondering "Oh so Dr Sonia is teaching her daughter to stamp?!" Well.....its the other way round... I have a somewhat cowardly bad habit of not wanting to try something unless I know " all about it !!" [Anyone there with the same traits....?] My daughter on the other hand has to play with a new craft supply the moment we get it!! Here is a photo to make you smile!! How many of us look so happy with our crafty projects!! PS : my dashboard has been acting real crazy and so I 'm having difficulty in catching up with blogs---I'm able to drop by friends who leave comments.I hope blogger acts better real soon!! Hi friends Thank you so much for the supportive comments on my Felt flowers layout - I hardly scrapbook so each and every feedback was so important to boost my confidence! 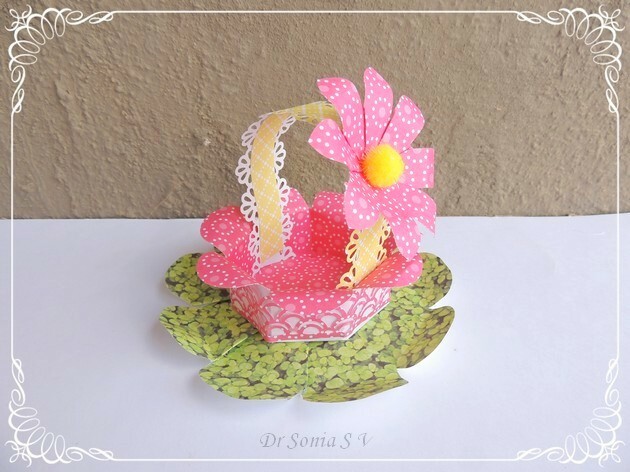 Some ideas are "accidental" discoveries and when I found that the 7- petal flowers made with the Flower punch board tend to stand upright , that gave me the idea to make flower baskets with them. 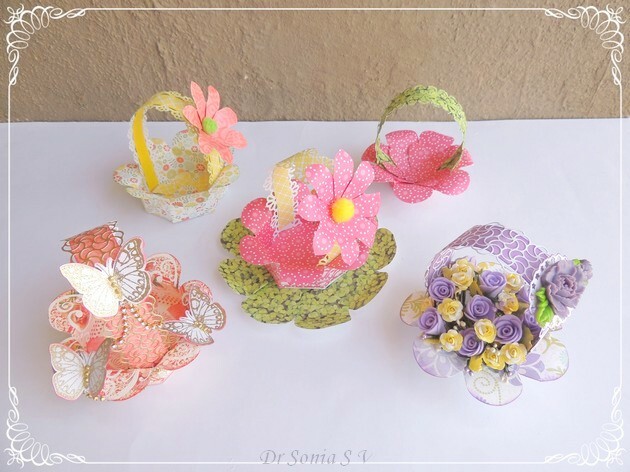 These Paper Baskets are quick and easy to make and will look good as home decor or party favours. I can just imagine filling up the baskets with little trinkets or candy as return gifts for parties! 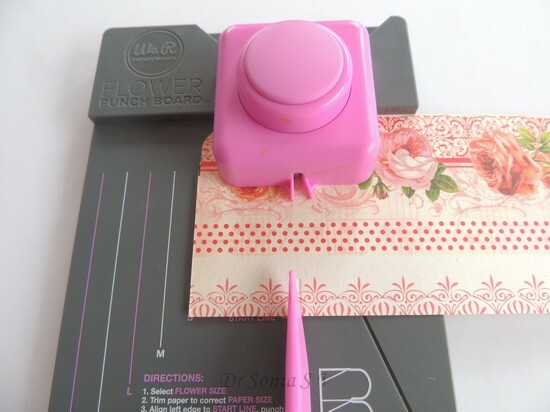 If you missed the Easy flower making tutorial do read it first to get familiar with the basic steps of how to use the flower punch board . 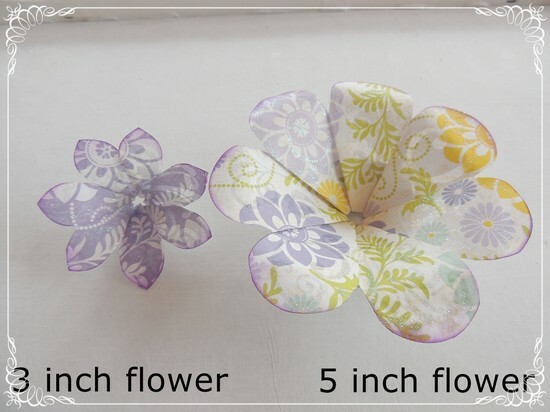 Make a 7 petal flower from the folded strip you made for the 5 inch flower .Gently roll down the flower petals using the shaping tool included in the Flower punch board.Even though the flower can actually stand upright like a basket you can make it sturdier by simply adding a cylindrical base to your flower basket . 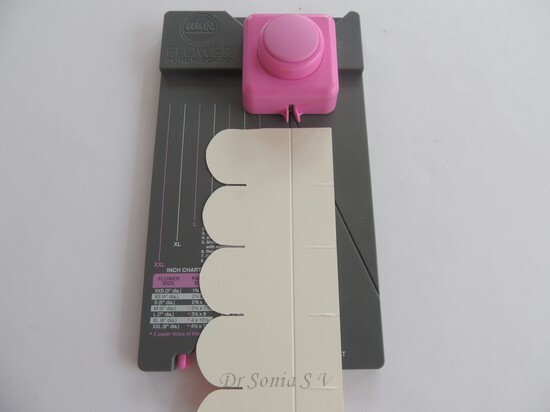 To make a base : Fold a 7 x 1 1/4 inch paper strip in half lengthwise[ you don't have to exactly follow this measurement!]. Glue the ends of this strip to get a paper ring. 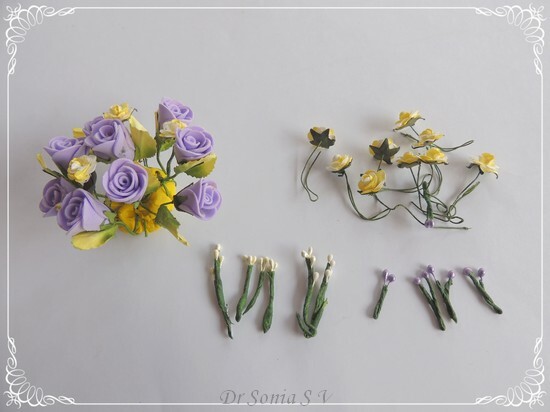 Glue this paper ring base on to the under-surface of the flower.You need to be quite generous with the glue in this step and be patient to let the glue dry while holding the parts! 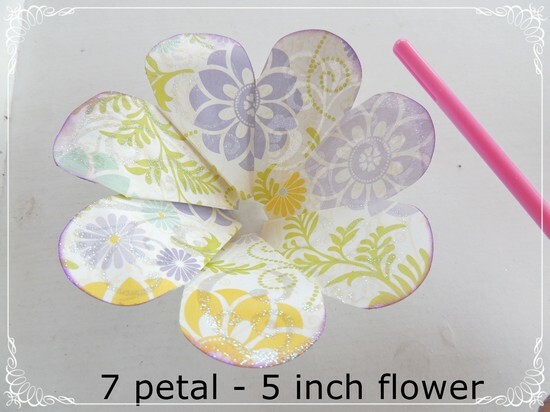 Make a 7 petal 3 inch diameter flower following the Flower punch board tutorial and stick it inside your larger flower. If there is still a gap in the center just add a punched circle to the center. Make a handle using matching card stock - again no hard and fast rules about the measurement [I used 11 x 1 inch strip] and taper the ends as shown in the pictorial above to allow easy gluing into the basket. The picture above shows the Flower basket on its stand. I couldn't resist adding a Resin flower on the handle of my flower basket! So salvaged the project by adding a bouquet of flowers to the basket! Poked foam flowers [ these are store bought ones but here is the handmade foam rose tutorial link], mulberry flowers and pollens [ these are normal pollens dressed up with floral tape] into play-dough [ instead of floral sponge!!] and added them inside the flower basket. Using the same tutorial steps you can make baskets as large as 12 inches in diameter using the flower punch board! I hope you enjoyed the easy basket tutorial ....do tell me how it is. Dear friends I am so overwhelmed at the kind comments on the Mummy and Me post ...Thank you so much ! 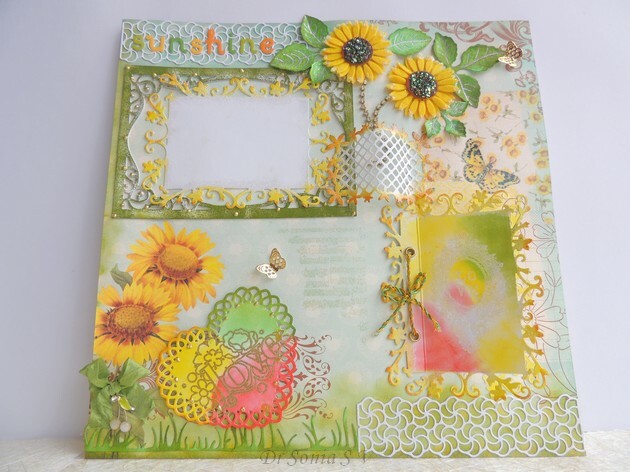 Sharing a simple summery layout I made for a swap with crafter friends in my city Bangalore--I somehow don't scrapbook much [Made only 3 layouts so far ! : Tulip tutorial ,Interactive Scrapbook, Foam in Scrapbooking ]but had to rise to the challenge as I didnt want to miss out on meeting my crafty friends ! 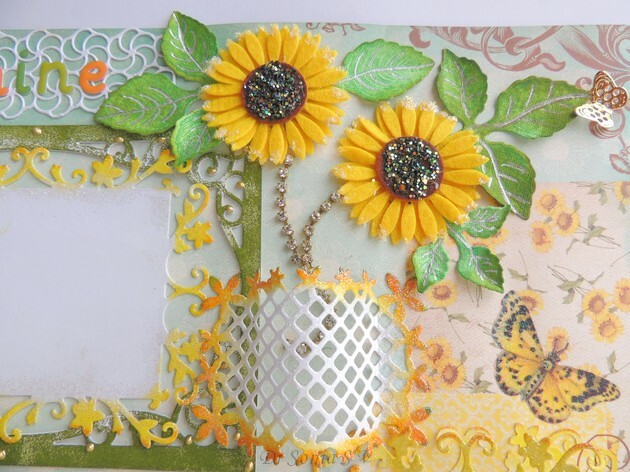 I love the Cheery Lynn Sunflower die [ more projects using it : Fairy Land Pop up Card , Paper and Sola Flowers, Paper Flower tutorial, Paper Flower Romance ] and used it to make these felt sunflowers.I layered 2 sunflower diecuts atop each other and added chunky glitter to the center. 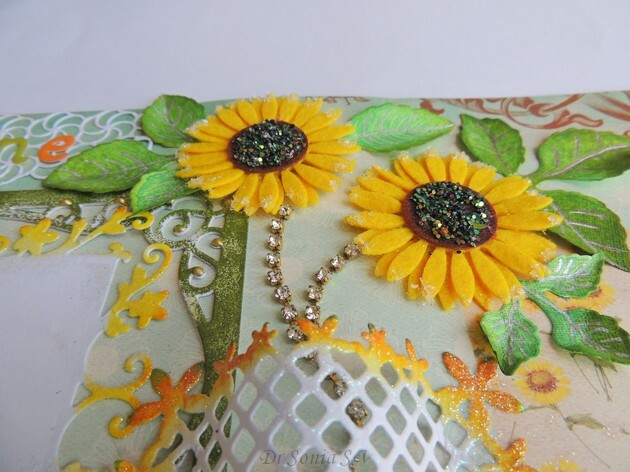 The edges of the felt sunflower petals sparkle as I added diamond dust too. And I couldn't help adding ny Heartfelt creations leaves[ You can see them on most projects I make these days!! 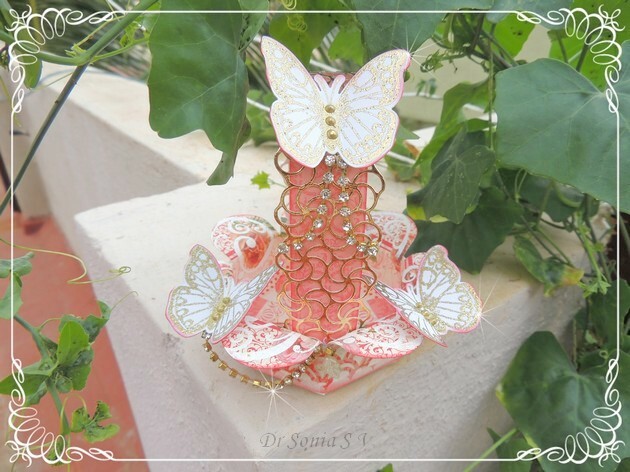 ]Made a 3 D vase using the Wild rose floral frame die which I heat embossed after inking with distress ink. Though I have been crafting for 4 years ,I only bought a heat gun recently so this layout has a lot of heat embossing! The Die cut frame for the photo was inked and heat embossed - I love the sparkle clear embossing powder gave the frame.Added golden liquid pearls in random on my embossed frame. In keeping with the theme added the word " Sunshine" in gel stickers. The theme of the layout was "colorful" so made my heart tricolor .I love to look at scrapbook layouts with fabric so added a crinkly ribbon bow and a bit of recycling too ! [The 2 white berries on a branch were salvaged from an old earring !]. 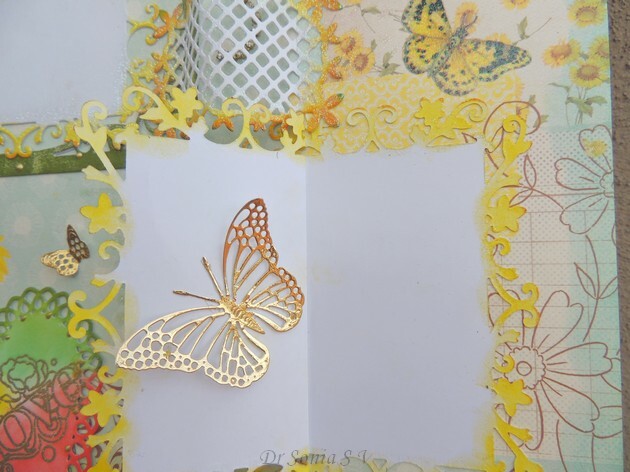 The " love " on both the heart and the journal mini card were stamped and heat embossed! I always feel like a smug cat when I can recycle something unique ! The sparkling crystal stone stems of the sunflowers were salvaged from an old dress ! I seem to be in love with yellow of late- there is something so cheerful and summery about it! I hope my layout has not come out too badly and I hope my swap partner likes it ---input needed! Dear friends I know some of you remember that we had an Egyptian theme Birthday party for my daughter's 8th birthday [see Scroll Shaped Invitation Card and King Tutankhamen Picture Frame tutorial ].The Egyptian Mummy prop we made was the big star of the party - not only did my daughter have days of fun making it- I think we made memories for life! I dont know how useful our Mummy making steps will be to you - maybe it will come in handy for a school project or a party or ......just sit back and enjoy a little girl's enthusiastic preparations for her birthday party! Little helper-such as shown below -essential for success of project! Scrunch up more newspaper to make Mummy's head.Make a big mess in the kitchen and forget about cooking! Recall /discover special surgical skills to fit Mummy's head to body ! Test out Mummy's joints by having the birthday girl dance with him! Perform a bit of orthopaedic manoeuvring to improve Mummy's height ----if the birthday girl demands Mummy has to be exactly as tall as her even to the nearest centimeter! If height matching doesn't quite succeed ,distract birthday girl by taking Mummy out into the garden to get acquainted with the dog ! Convince little girl that best friends are not always the same height! 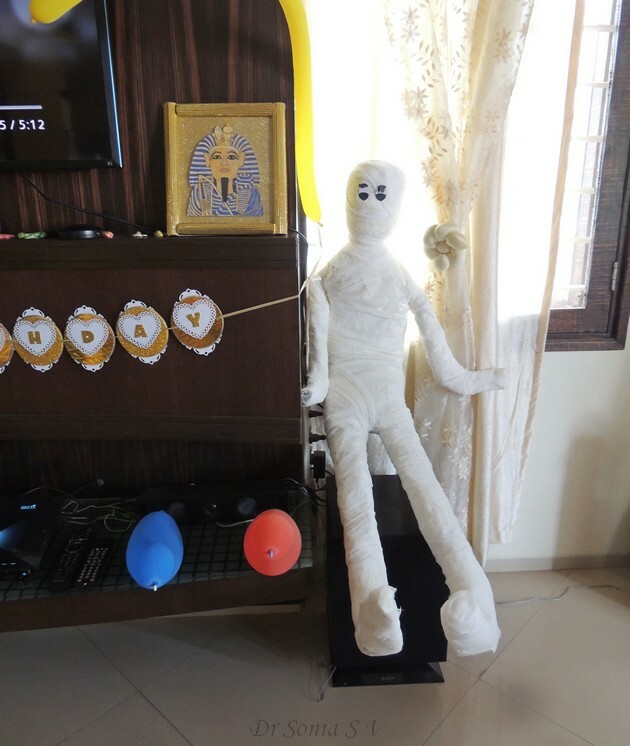 Give Mummy a gauze roll over to make him more handsome + stronger so that he would survive the birthday party with dozens of little girls and boys inspecting him! Let the birthday girl make cute eyelashes and eyes for her Mummy! And the Mummy is ready to Party! So here is Mummy sitting in our hall near King Tutankhamen's picture with the Golden Birthday Banner awaiting the arrival of guests! And that's the birthday girl posing in front of her Pyramid [we made it from chart paper and painted it Gold], Hieroglyph Stone which spelt her name [made with salt dough], homemade Birthday banner and the Mummy! My little girl became quite attached to her Mummy giving her a big " Umma" [ translates to Kiss] ! Our Mummy was a big hit at the Party and the kids even had a "dance with the Mummy"session [which mummy survived]!! Hoping our Mummy could bring a smile to your day! 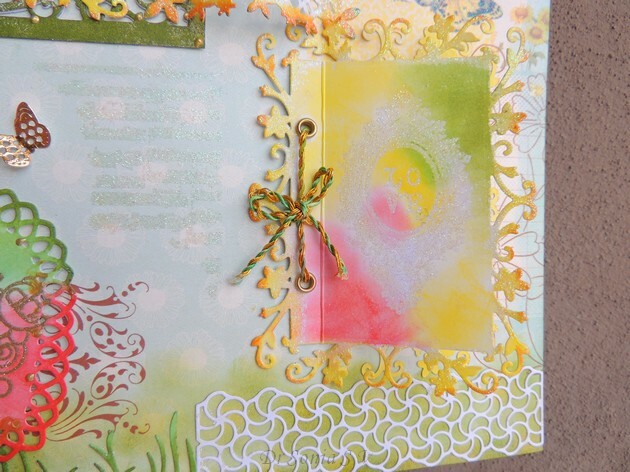 Edited : This tutorial was featured at Craft Gossip Party Ideas.....thrilled!! 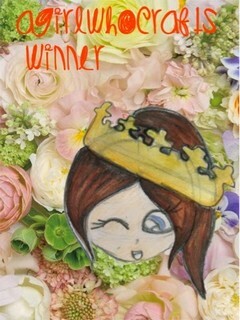 And was declared winner at A girl who crafts !